Each player will be furnished a Jersey, Visor (excludes JR/SR's) and Socks which they get to keep. Softball/Baseball pants are highly recommended to prevent abrasion injury and prevent infection when sliding. Each team may discuss the color they prefer but Gray is always a good choice and can be reused for the following season. Each player is required to provide their own batting helmet for health and safety reasons. The sharing of helmets is highly discouraged. Helmets must meet the NOCSAE standards and have a facemask to use in the PRO Papillion Softball program. 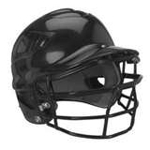 In general a one-size-fits-all 6 1/2 - 7 1/2 helmet is usually a great choice as it can be reused in following seasons. To determine the size your player needs, you can do the following to calculate the exact size. Start by placing the end of a measuring tape just above the top of the wearer's ear. Wrap the measuring tape around the head to measure the circumference of the head. The tape runs along the forehead (above the eyes) and the occipital bone (the "bumpy" bone on the back of the head). Finish at the same ear where you first placed the measuring tape. Read the measurement marking nearest to the spot where the two ends of measuring tape meet. Divide the head measurement derived in Step 3 by 3.1428. This number is your approximate batting helmet size. For example, if the measurement from Step 3 was 22 inches, the batting helmet size will be 7 (22 divided by 3.1428). Round up to the nearest 1/8 inch once you've found the number, as batting helmet sizes are sold in 1/8 inch increments. Try the batting helmet on. The ear straps of the batting helmet should cover the ears all the way down to the lobe, and the top of the head should fit comfortably yet snug inside the top of the helmet. If the helmet's brim obstructs your view, the helmet is too big. The helmet is too small, however, if the ear straps don't cover the ears down to the lobes. Players are recommended to have their own bat for comfort and better performance. Some team bats may be provided. When selecting a softball bat for your player getting the correct length and weight is important. Evaluate the bats based on your height. Softball players shorter than 4 feet tall should pick a bat 27 to 29 inches. Players between 4 and 5 feet tall typically use bats 29 to 31 inches. If you are 5 to 6 feet tall, a bat that is 31 to 34 inches will work best. Finally, those taller than 6 feet should purchase a 34-inch bat. Decide how heavy you want your bat to be. Strong softball players should choose a heavier bat to take advantage of stronger swings. Weaker players should use a lighter bat. 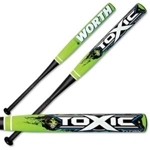 To select the proper weight of a softball bat have your player hold the bat out at shoulder height for 30 seconds. If they can hold it longer than that it is probably to light. If they cannot hold it for almost 30 seconds then it is probably to heavy. In the end make sure that you test the bats. Although these guidelines are a good tool to weed out bats that are wrong for your player, it is important to take a few swings in order to determine which bat feels best. Getting the right size and weight bat for your player allows them to use it for more than one season in most cases. Players must provide their own softball glove. 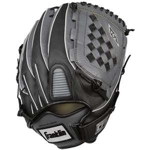 A general softball fielders glove is recomemded. When selecting a glove for your player it is most important to sleect a glove that they can control. Giving a youngster two or three extra inches from the top of their fingers to the top of their glove is incorrect because they will not be able to close the glove with any kind of ease and won't be able to catch the ball. The first thing you should look for when purchasing a glove for a young player is one that is small enough to operate correctly. 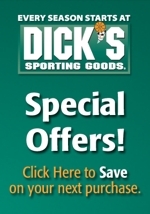 The glove must be big enough to catch and hold a ball and that can be determined at the sporting goods store. A younger player should have a glove that is about an inch longer than the spot the top of his fingers reach in the glove. PRO Papillion Softball requires rubber soled cleats for all players during practices and games to prevent injury to themselves or others. As an alternative, tennis shoes are an acceptable option if rubber soled cleats are not available. The first thing to remember when choosing softball cleats is that the size of the cleat is the most important part of buying any shoe. One must ensure that the cleats fit so that they do not rub, pinch, or irritate anywhere on the foot and that the shoe does not fall off when the player runs. The sales associates can help with finding the correct size by measuring the player’s feet, and the player should know to try on a lot of different sizes and walk around, even run if allowed, to ensure that the size is correct. Once the correct size has been picked out, the player can begin to look at different styles of cleats. For softball, molded cleats are better to use than spikes as they are safer for all the players. However, the design of the shoe can be whatever the player desires. Many times when choosing softball cleats, a young player is more likely to wear a shoe that he or she likes the look of over a more functional cleat. Therefore, if a parent is buying the softball cleats, it would be a good idea to give the player a choice of a few styles and brands that are within the buyer’s price range. 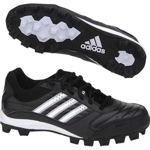 This way the buyer’s budget does not have to take a big hit, but the player still has a say in choosing a pair of softball cleats that he or she likes the most. To conclude, choosing softball cleats do not have to be confusing and expensive. The right size and style of cleat can be found by just looking in the right section and being informed on the right equipment to purchase. It is also important to remember that baseball gear and softball gear are not the same at all, and the buyer and player should be aware of looking in the correct section of the store.